The word stress has become a common word to explain the level of anxiety we experience in a given situation. Typically, as the event subsides, so do our heightened emotions, and within a short time we are able to return to normal daily functioning. Physical symptoms – headaches, back pain, jaw pain, stomach problems, high blood pressure, rapid heartbeat, sweaty palms, dizziness, shortness of breath. Acute stress is treatable and manageable within a shorter time frame. Typically the symptoms don’t last longer than a month. Regular acute stress can be classified as episodic acute stress which is explained by a regular series of highly stressful events. Some of these events can be external or a reflection of the client’s perception. The classic “Type A” personality by experience episodic acute stress. Chronic stress is the ongoing grinding stress that is experienced usually over a lifetime. A person experiencing chronic stress may have lived in a dysfunctional family, been raised in poverty, entered in an unhappy marriage, have a highly stressful or unhappy job. The unrelenting pressure of the events over the individual’s lifetime usually results in overall poor health as well as an inability to recognise the effects of stressful events due to the familiarity over a lifetime. PTSD occurs after a stressful event that is threatening in nature. The feelings of distress are pervasive and extend beyond the typical 4 week period that occurs with acute distress. For that reason, a diagnosis of PTSD is typically not given until after a month. Typical stress events include natural disasters, war, serious accidents, situations involving violence and abuse or witnessing these violent situations. PTSD is treatable and success has been documented around the benefits of art therapy with combat veterans. Research has found that art therapy can improve the way in which individuals process the trauma through recall and accessing emotions. 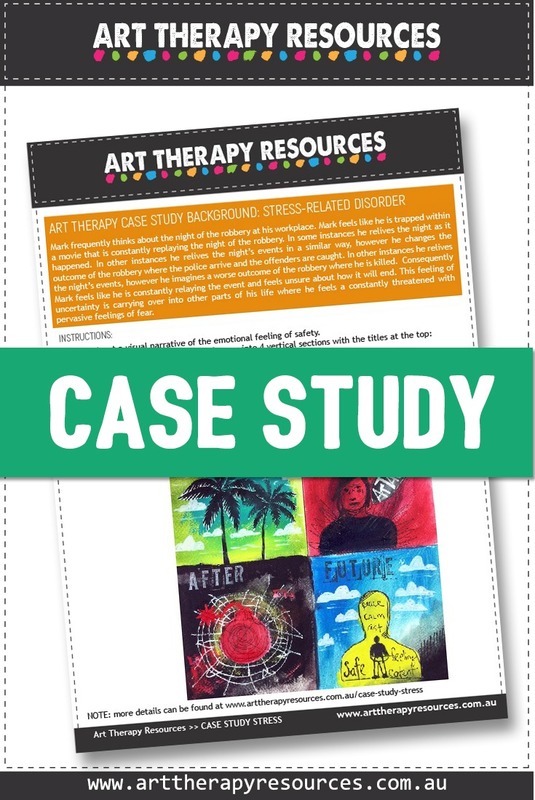 You can read an excellent case study of using art therapy with an active duty military service member with symptoms of chronic PTSD and mild TBI (traumatic brain injury). Summary of sessions to date: Mark had experienced a hold up at his workplace 2 weeks ago. Another therapist had referred him for Art Therapy to help him deal with pervasive thoughts connected to the robbery. The other therapist knew that Mark was interested in art. Mark frequently thinks about the night of the robbery at his workplace. Mark feels like he is trapped in a movie that is constantly replaying the night of the robbery. In some instances, he relives the night as it happened. In other instances he relives the night’s events in a similar way, however, he changes the outcome of the robbery where the police arrive and the offenders are caught. In other instances he relives the night’s events, however, he imagines a worse outcome of the robbery where he is killed. Consequently, Mark feels like he is constantly relaying the event and feels unsure about how it will end. This feeling of uncertainty is carrying over into other parts of his life where he feels a constantly threatened with pervasive feelings of fear. 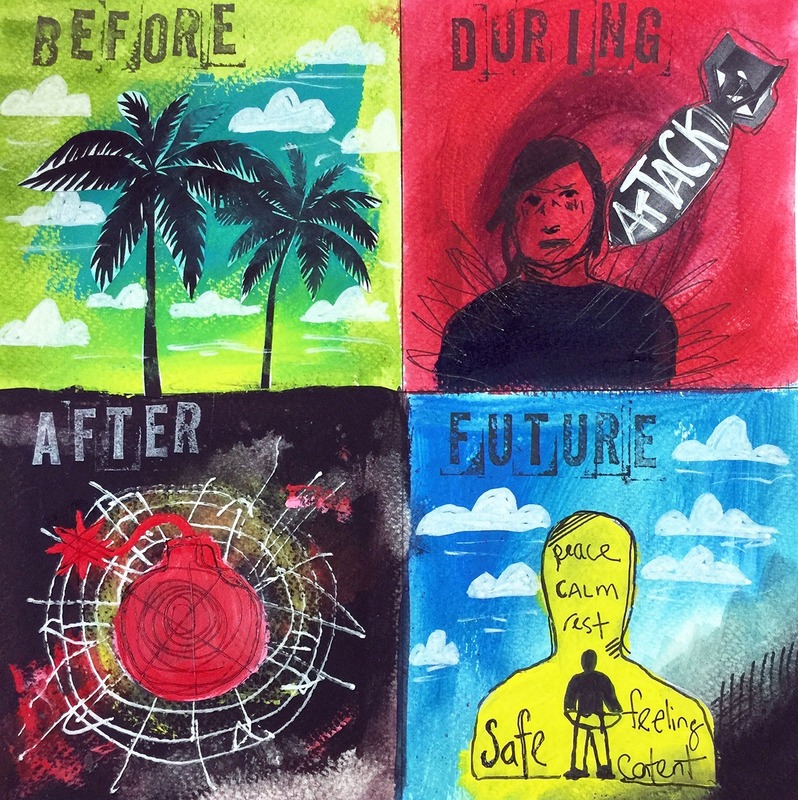 Construct a visual narrative of the emotional feeling of safety. Alternatively your client can create each section on 4 separate pages. 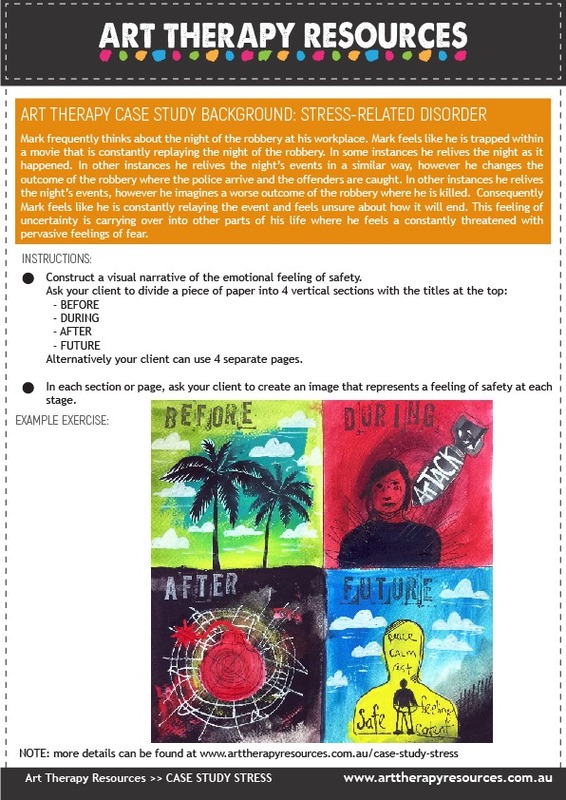 In each section or page, ask your client to create an image that represents a feeling of safety at each stage. After completing the art therapy exercise, Mark was able to understand that this trauma represented a moment in time. He could see that life at various stages can be safe for him and that the incident is impacting him at this time. Mark’s use of the ticking time bomb was a reflection of how he felt at this time. He felt he was emotionally unstable and could “go off” at any time. Upon reflection, the bomb analogy provided insight into how he could learn to implement techniques that might defuse the emotional feelings he had. Mark felt hopeful that he could move into another era of feeling safe. Mark felt the exercise gave him some clarity on how he was stuck in a moment of time and that if he felt safe before the event, there was hope he could feel safe again.